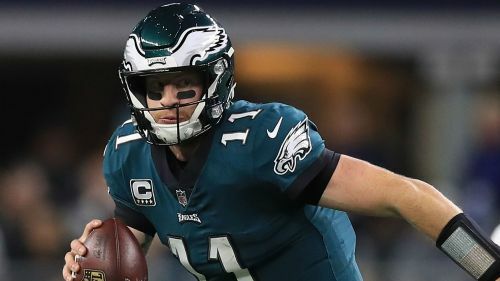 Philadelphia Eagles quarterback Carson Wentz said he still is recovering from the back injury that derailed his 2018 NFL season. Wentz revealed his back is not 100 per cent healthy after he suffered a stress fracture at the end of last season, however the Eagles star added that he feels good and expects to be ready to go for the start of 2019. The 26-year-old said told reporters on Monday he has started running and throwing the ball as the team began offseason conditioning, but admitted he is "week-to-week." When asked if he expects to be ready by Organised Team Activities (OTAs) at the end of May, Wentz said, "That's the plan." "But there really is no timetable, no rush. But I feel good with the progression I've been on." Wentz being sidelined for the final three games of the Eagles' regular season was a heartbreaker, since it marked the second campaign in a row he had to miss the playoffs. The QB said he is being patient now and going off how he feels, not whether if he is completely healed at this point. "It's still getting there. It's still getting there," Wentz said of his back. "Some of this stuff just takes time, but that's not really the main concern, it's just kind of how I feel. I feel pretty good with where I'm at." Wentz added he understood people are questioning whether he is a franchise quarterback, given his list of injuries in his three short years in the NFL. Despite a stellar campaign in 2017, Wentz suffered a torn anterior cruciate ligament that saw him miss playing with the Eagles as they clinched Super Bowl LII that season. "I get it. I get it," he said. "I'm looking forward to putting those [questions] behind me. I understand it's a part of this league, it's a physical league and things happen. But it's one of those things that's out of my control, and I look forward to putting that behind me."